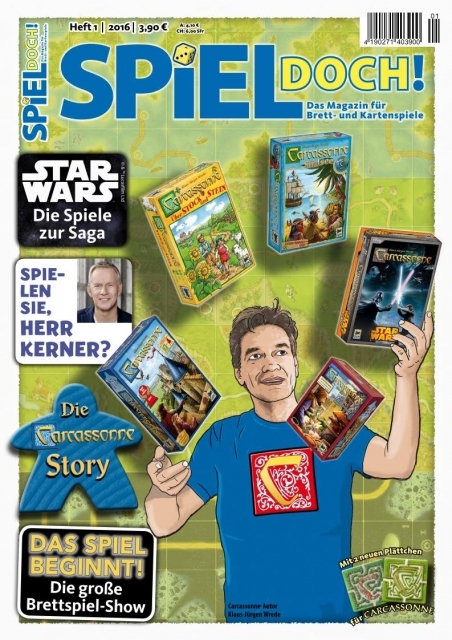 Carcassonne, Star Wars and more in the 2nd issue of SPIEL DOCH! Including there is the mini-expansion "Labyrinth" to Carcassonne. One tile in the classic stile and one tile in the new stile of Carcassonne. Werkstattbericht: Wie arbeitet eigentlich ein Spieleautor? Spiel doch: Simsala ... Bumm? This is a new magazine about board- and card games for newcomers. This is the German edition of spielbox! For the English edition please search after "spielbox 2012/1 - English edition"
You will find the content here soon. You can order the issue from now on. This Product was added to our catalogue on Friday 04 March, 2016.